Fullilove’s passion for food grew partially from his cultured childhood experience. Born and raised in Cleveland, Ohio, Fullilove spent the remainder of his youth in Massachusetts, New York, and Zambia in Southern Africa. He then enrolled at New York’s Culinary Institute of America, but before obtaining his degree, was offered the Chef De Cuisine position at the Ritz Carlton USVI in St. Thomas. He took the job and gained key executive experience through the management of the resort’s onsite restaurants. In 2009, Fullilove moved to California to serve as Executive Chef of highly regarded restaurant Campanile before continuing on as Executive Chef for the Los Angeles County Museum of Art. While at LACMA, Fullilove opened up his own art-inspired pop-up restaurant, RED, where he created ever-changing tasting menus that showcased the local, organic, seasonal, and farmer-centric mentality that so inspires him. 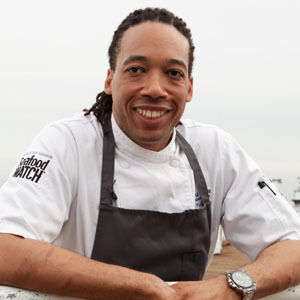 Jason Fullilove is now the chef and owner of Ethereal Plate, before which he worked as the executive chef of Malibu Pier Restaurant & Bar in Malibu, California. Chef jason serves fresh and innovative New American cuisine, placing an emphasis on sustainability through locally-sourced ingredients. With write-ups in Food & Wine, the LA Times, and Time Out, Fullilove is becoming a topic of conversation. Fullilove’s commitment to wild, organic, and natural products remains at the forefront of each of his culinary endeavors. Keep current with all things Fullilove by visiting his website, etheralpalate.com. This delicious salad combines seared yellowtail tuna with a poached egg for a protein-rich, healthy meal. Clarifying butter removes the milk fats and raises the smoke point, allowing you to cook with butter over high heat.